This week Neil MacGregor’s superb series for BBC Radio 4, Germany: Memories of a Nation, reaches its conclusion – fittingly timed to coincide with Germany’s Schicksalstag, or Fateful Day, the ninth of November. In our lifetime it’s the opening of the Berlin wall on 9 November 1989 that we all remember. But, strangely, a succession of significant events in German history have occurred on 9 November. In 1938, in the Kristallnacht, synagogues and Jewish property were burned and destroyed on a large scale; in 1923 it was Hitler’s failed Beer Hall Putsch, marking the early emergence of his Nazi Party on Germany’s political landscape; in Berlin on 9 November 1918, Kaiser Wilhelm II abdicated and two German republics were proclaimed – the social democratic one that was eventually known as the Weimar Republic, and Karl Liebknecht’s Free Socialist Republic; further back, in 1848, the year of revolutions, on 9 November Robert Blum, the democratic left liberal leader was executed by Austrian troops, leading to hopes for a united, democratic Germany being extinguished for another half century. All of these events were touched upon by MacGregor in three weeks of brilliantly concise and impassioned 15 minute essays. Once again – as in A History of the World in 100 Objects and Shakespeare’s Restless World, MacGregor takes often mundane, everyday objects and uses them to tell stories – in this case weaving around them a history of the German nation that was both magisterial and heartfelt. At the conclusion of many episodes I was left awestruck both by MacGregor’s scholarship and his ability to communicate ideas with clarity and feeling, often making connections between seemingly unconnected places and events. It’s not surprising really, since MacGregor studied German at Oxford, and has had a lifelong passion for German history and culture. But what really made this series gripping listening was his keen sense of the role that the German people have played in European history – and the personal interpretation he brought to that history, one deeply rooted in strongly-held values. I’ve always been strongly drawn to Germany, its history and its culture. The country and its people made a deep impression during a week-long stay in Cologne with students in the 1990s, and a visit to Berlin on the 10th anniversary of the opening of the Wall felt like walking through the history of the 20th century. All around were the remains of that history: of the terrible years of Nazi rule, wartime damage and destruction, Cold War division and then reunification. What was striking in 1998 was the evidence of a nation at last striving to come to terms with its past after the post-war years of forgetting. Everywhere there were memorials that required Berliners, Germans – Europeans – to come to terms with their past. 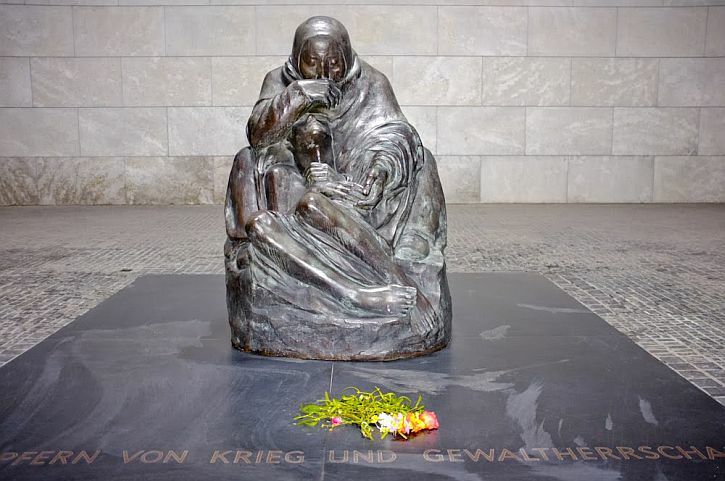 I particularly remember Kathe Kollwitz’s Pieta, ‘Mother with Dead Son’ chosen as the centrepiece for the German Memorial for the Victims of War and Dictatorship, housed in the Neue Wache, the old imperial guardhouse. And Micha Ullman’s memorial on Bebelplatz to the Nazi book burnings of 1933. What impressed me then – and came across strongly in Neil MacGregor’s essays as they moved into the 20th century – is how strenuous have been German efforts in the last three decades to face up to their past and the memory of the Third Reich and the Holocaust. Berlin’s memorials explain why I feel so drawn to Germany: the terrible history of the Nazi years and the Holocaust is a lesson not only for Germans, but for all Europeans. This where the noble traditions of German civilization – literary and legal, ethical and musical -were brought to nothing. What began here in cruelty and injustice in 1937 ended in the destruction of cities and societies from the Atlantic to the Urals. In death camps like Auschwitz, in genocide and in the killing of millions. No words can adequately carry such brutality and such suffering. There can only be silence. And there was silence: a full minute of rare radio silence, a pause to allow listeners a moment to think of the unthinkable. Buchenwald was not an extermination camp – though 50,000 died there – but it was, said MacGregor, a critical step on the road to Hitler’s Final Solution. His object here was the camp’s gate, and its inscription – facing inward, and only meant to be read by the prisoners – the motto, ‘Jedem das Seine’, meaning ‘to each what they are due’. Deliberately designed as a taunt to the prisoners, the words proclaim a high ideal of justice. They were quoted by Luther, and Bach set them to music. ‘Could any three German words have a nobler lineage’, wondered MacGregor. 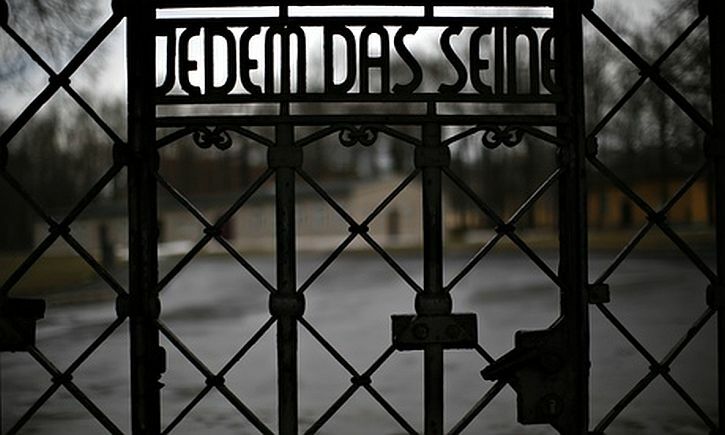 In a particularly acute way, the words on the Buchenwald Gate raise the unanswerable question of modern German history: how can these different components of the German story fit together? How could all those humane traditions collapse? One answer, of course, lies in the humiliation of Germany by the victorious allies at the end of the First World War and the subsequent instability experienced by all Germans. In ‘Money in Crisis’, Neil MacGregor illustrated that instability by describing the British Museum’s extensive collection of emergency money or notgeld, issued by towns and cities during the hyperinflation of the early 1920s. The next day, MacGregor devoted his talk to Kathe Kollwitz, arguing that she is one of the greatest German artists. Like no other artist of the time, Kollwitz gave voice to the overwhelming sense of personal loss felt by ordinary Germans in the first four decades of the 20th century – ‘the loss of a whole generation, the loss of political stability and of individual dignity’. MacGregor began the episode in the Neue Wache in Berlin, a building which has served as a war memorial three times – as the Prussian memorial to the Napoleonic Wars, the Weimar Republic’s memorial for the First World War, and the Soviet memorial for the Victims of Fascism and Militarism in the Second World War. Now it serves as a place for Germans – and people of all nationalities – to reflect on the victims of all wars and tyrannies. I am working on a small sculpture which has developed out of my attempt to make a sculpture of an old person. It has become something like a Pietà. The mother is seated and has her dead son lying between her knees in her lap. There is no longer pain – only reflection. Her sculpture is, indeed, ‘something like a Pietà’, but, as MacGregor explained, it differs significantly from traditional Christian Pietà representations. In Käthe Kollwitz’s sculpture the dead boy is huddled on the ground between her legs, totally enclosed by his mother’s body. It is as if the mother is attempting to shield her son from harm, though he is already dead. The pathos of her futile gesture means, argued MacGregor, that nothing in this image suggests sacrifice to achieve a higher purpose. ‘There is no hint of salvation here; merely grief in the face of slaughter’. Helmut Kohl was reproached by critics for choosing this sculpture. Some said that one woman mourning her son could not do justice to the victims of the Holocaust and two world wars. But, argued MacGregor, ‘most people can only identify with the personal’. Her monument , he insisted,sums up the suffering of everybody – in all wars, in all tyrannies. Among the critics of Kohl’s choice of sculpture was the doubt: was this one woman with one son enough? Looking at this statue in the Neue Wache one wonders: could any image say more? This pot obviously said a lot to Joseph Goebbels. 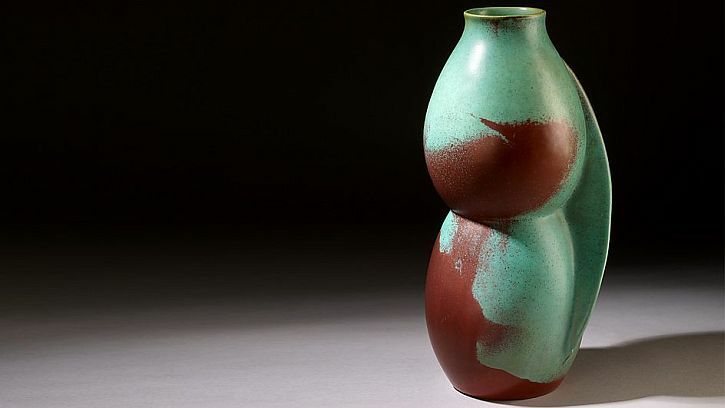 Neil MacGregor chose the Bauhaus-educated Grete Marks’ pottery as the object to illustrate how, in Nazi Germany, such pottery might be deemed politically dangerous, an example of ‘degenerate art’ – books, music, paintings and even pottery – that had to be purged in order to purify German culture. Grete Marks’ ceramic designs were publicly derided as ‘degenerate’ by Joseph Goebbels in his newspaper, Der Angriff. After her factory was seized by the Nazis, Grete fled with her two sons to England. The Nazis continued in their relentless pursuit of degenerate art. In ‘Purging the Degenerate’, MacGregor stood on Berlin’s Bebelplatz to describe the infamous book burning there in 1933, now commemorated in a plaque inscribed with Heine’s prophetic remark of 1821, ‘where they burn books, they end up burning people too’ and by Micha Ullman’s underground Bibliotek memorial which consists of a window on the surface of the square, under which empty bookshelves are lit and visible. He concluded, ‘the burning is an event that lives on in the German memory as a moment of high shame’. In language that is uniformly violent and shrill, it identified the categories of artistic perversion which required rooting out: cultural anarchy, Marxist propaganda, pacifist representations of the horrors of war, Jewish Bolshevik distortions, negroes and South Sea islanders presented as ideal human types, the choice of idiots, paralytics and cretins as models. Chillingly, as you read it, you realise that while the catalogue is talking about objects, these are also the categories of people whom the Third Reich would soon imprison or eliminate. From works of art to people was a short step. Germany: Memories of a Nation has helped me understand Germany far better than I did before. In the early episodes MacGregor explored how Germany as a nation emerged from a collection of small, independently minded city-states within the Holy Roman Empire. He illustrated this with examples from around 200 different currencies struck in the different territories of Germany. It is, he explained, an immediate and physical way of grasping the complexity of the German lands, because every coin represents a kind of sovereignty. 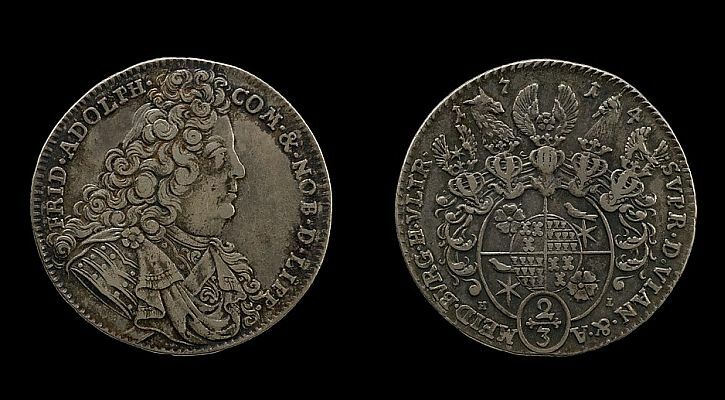 To be able to strike a coin you needed to be the ruler in your territory – and every coin speaks of a particular state, with its particular laws and a whole set of traditions. But this wasn’t simply Medieval history. In every episode, MacGregor pointed up the significance of the past in helping us to understand the Germany of the present: in this case, its federal structure and powerful local traditions and institutions. And he devoted a whole episode to another example of the strength of German regionalism, beer and sausages, explaining how the multitude of regional specialities represent centuries of regional history and diversity. In Strasbourg, he revealed the significance of Charlemagne (or Karl der Gross) to both France and Germany; in Prague and Kalingrad he took German-speaking Kafka and Kant as examples of lost German lands; in Frankfurt he explored the huge national significance of Goethe for Germans; in London he chose Holbein’s 1532 portrait of Georg Gisze, a Danzig merchant trading in London to exemplify the operation of the Hanseatic League, the great trading alliance of 90 cities, including Lübeck, Hamburg, Danzig, Riga and London. These are just a few examples from an endlessly-stimulating and wide-ranging series that has been, quite simply, one of the best radio series of recent times. What a great public communicator and educator Neil McGregor has become through his three radio series. His 2010 magnum opus, A History of the World in 100 Objects gained more than 4 million regular listeners and more than 10 million podcast subscribers, half of them from outside the UK (because the programmes are still available, those numbers keep on rising). Neil MacGregor brought the series to a close with a deeply reflective piece about Ernst Barlach’s sculpture Hovering Angel, a unique war memorial, commissioned in 1926 to hang in the cathedral in Güstrow. It is, he said, an example of the way in which, in the last few decades, Germans have been ‘thinking about the past with an intensity which is very rare’. Ernst Barlach was one of Germany’s great Expressionist artists of the early 20th century. In 1927, he created for the cathedral in Güstrow, a small town north of Berlin, a war memorial called Der Schwebende (The Hovering Angel), the figure of a grieving mother floating over the battlefield, haunted and grief-stricken. The sculpture is suspended from the ceiling, and is far from the monumental structures that usually commemorate the dead of wars. In 1937, the Nazis declared Der Schwebende ‘degenerate’ and had it melted down to make munitions for the next war. But another copy was secretly cast from the mould, and after World War II it was installed at Güstrow, then in the eastern half of the divided Germany. Like Germany itself, it has been dishonoured, destroyed, dismembered and refashioned. But it has always carried in itself the survival of an ideal and a hope of renewal – even when it has been absent. In Britain we have monuments to things in our past that we are very proud of. The Germans put up monuments to their own shame, and that makes them very different from almost any other country. They do that as a reminder of how they ought to behave in the future. In the exhibition here, Barlach’s Angel will embody the war fever of 1914; pacifism in the 1920s; the humane art of Käthe Kollwitz; the destruction of ‘degenerate art’ by the Nazis; the western front in the first world war and the bombing of Berlin in the second; the postwar division of Germany and the dialogues that were possible in spite of it; the millions of victims of 20th-century conflicts; the continuing painful and difficult conversations between Germany and the rest of the world in the quest for resolution and reconciliation; and unquenchable hope. I can’t think of any other exhibit that has such profound resonance. How, asks the exhibition, can anyone understand a nation’s history when burned into our gaze is a darkness as unfathomable as the Holocaust? And how can a nation’s identity be reconstructed after such an episode? Baiting Germany about defeat, whether on the battlefield or the soccer pitch, became as much part of being British as drinking tea or complaining about a wet summer. From a constant diet of World War II films on TV to excruciating jokes about vacationing Germans always seizing the best lounge chairs by the pool, anti-German chauvinism was stitched into British culture. A century ago, most educated Britons would have had a deep appreciation of German history, music, philosophy and literature. Today, the role of Germans from the Enlightenment to Modernism in constructing our very conception of the world is barely acknowledged and little understood. It is not just German history about which Britain lacks insight. While the enormity of the Holocaust has forced Germany to address the darkest aspects of its past, Britain has never had to think about its history in that fashion. From the Opium Wars to the Bengal famine, the shameful episodes of Britain’s imperial past are rarely discussed. Perhaps nowhere is this blind spot more obvious than in the current debate about World War I. There has been much discussion in Britain about the role of German militarism and imperial ambitions in fomenting war. Rarely acknowledged is that all the great powers of the time had expansionist aims; that in the decades leading to the war, they had carved up the globe among them; that at the centre of the global imperialist network stood not Germany but Britain. 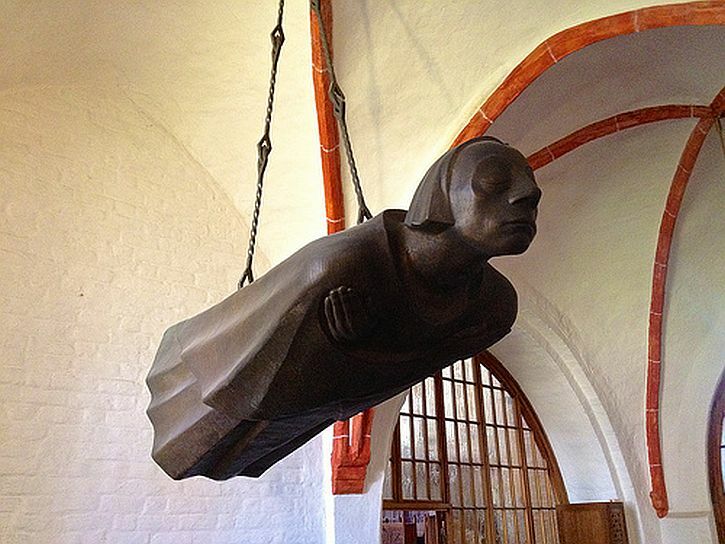 Set against such historical blindness, there is something resonant about Ernst Barlach’s floating sculpture, which embodies so many of the complexities and contradictions of history. The story of the sculpture, as the British Museum’s director Neil MacGregor wrote in The Guardian, “is the biography of Germany in the 20th century,” from the militarism of 1914 and the reaction against it, to the horrors of Nazism, the postwar division of Germany and the continuing quest for reconciliation. That Barlach’s work can carry so much weight of meaning says much about its haunting power. But it also asks questions of us. Can we carry that weight? Can Britons stop viewing history as black-and-white, and start acknowledging its complexities and contradictions? While listening to Neil MacGregor’s radio series, and mindful of the approaching 25th anniversary of the fall of the Berlin Wall I’ve also been reading Cees Nooteboom’s Roads to Berlin, a collection of articles he wrote whilst present in Berlin during those heady weeks in 1989, and at other moments in the decades since. We have also been watching again Edgar Reitz’s monumental series, Heimat, which we first saw when it was broadcast on BBC 2 in 1985. But more about that fine and beautiful series in a future post. Thinking about Kenan Malik’s comment on the British attitude towards Germany, I can see, in my son’s GCSE History studies, how useful Germany is as the monster nation. The GCSE syllabus requires students to study and write essays on Nazi Germany. The country is treated as if it only came into existence in 1914 and was a wrong’un from the very beginning. Most of his peer group will take that attitude into adult life with them. All very back and white, with the pigments chosen by us. I think you are absolutely right about the way in which Germany is brought into the History syllabus in England & Wales. Now, if the examiners sat down and listened to Neil MacGregor’s series, might they come up with a different approach? They would, but I suppose that approach wouldn’t serve the government. Not to be all conspiracy theorist, but the way History is taught does serve the nation’s preferred idea of itself. It was all Kings and Queens of England when I was at school, which probably says something about the interests of the time. It’s Ancient Egypt (mummies) and the Victorians at Primary school now and Nazis with a bit of Civil Rights at secondary school. We were in Berlin last week and I was very interested to meet up with an archaeologist who had grown up in East Germany and believes that the story of the Berlin Wall coming down is being used and trimmed to support the way that West Germany wants to see itself – a wonderful free and successful capitalist economy that saved the poor East Germans. She says that there is a lot that is left out of the picture – gender equality in the workplace was one of the things she mentioned – and some of the things that got lost during reunification. East Germany has to be seen as wholly bad for West Germany to seem undeniably better. Interesting, isn’t it? Large numbers of ordinary workers lost their jobs, but so too did thousands of research workers and academics. As a result of the purging of academia, research and scientific establishments in a process of political vetting, more than a million individuals with degrees lost their jobs. This constituted about 50% of that group, creating in east Germany the highest percentage of professional unemployment in the world; all university chancellors and directors of state enterprises as well as 75,000 teachers lost their jobs and many were blacklisted. This process was in stark contrast to what happened in west Germany after the war, when few ex-Nazis were treated in this manner. In the GDR everyone had a legally guaranteed security of tenure and ownership to the properties where they lived. After unification, 2.2m claims by non-GDR citizens were made on their homes. Many lost houses they’d lived in for decades; a number committed suicide rather than give them up. Ironically, claims for restitution the other way around, by east Germans on properties in the west, were rejected as “out of time”. The comments under Bruni de la Motte’s article are pretty caustic, aren’t they? It’s interesting that Philip Oltermann seems to attract more mellow, reasoned responses. Mostly, I can’t bear to read below the line on the Guardian website. The comments seem to be written by people who make snap judgements based on a quick scan of an article. That is a superb article that you link to in your final paragraph. He writes:’The layers of history which have grown over the centuries surround us every day. These various layers permeate our lives and put us in a line with all those people who have lived before us. It´s not impossible nor expensive to make this history come alive, to be accessible.’ And he gives many examples of the imaginative ways in which this has been done in Berlin. I mentioned the Stolperstein in a post I wrote last year on the anniversary of Kristallnacht (http://wp.me/poJrg-4r4). It’s interesting that you think it’s written by a he – she’s a she. I read a post the other day and thought it was written by a man (it wasn’t. It’s fascinating how we pick up clues from the written word. I wonder how somebody would have to write for me to assume that they were a woman. It’s a bit like that thing we do with babies we don’t know, if we need to say ‘He/she’s dropped his sock’ or whatever – if they’re not wearing pink or blue. We make a guess, based on some kind of subliminal clues. There’s something that says male or female human to us. Anyway, I’m going to send her a link to your blog because I think she’d really enjoy it. And, as you say, if the marvellous Neil MacGregor were skyped into every school History class, our children would grow up with a rather more nuanced attitude towards Germany. That was supposed to say ‘black and white’! Thank-you for such a thoughtful and thought-provoking post. Kenan Malik is bang on. As are the comments about the syllabus in Britain. My wife’s only lived here for a few years and she’s already fed up hearing about World War 2 and the Nazis! The accompanying exhibition could have done better on the darker chapters like the holocaust (as the radio series did), but overall I think it does a brilliant job in giving the British public a fresh and broad insight into German history.